Skinny Jeans & a Chai Latte: First stop :: Prague. 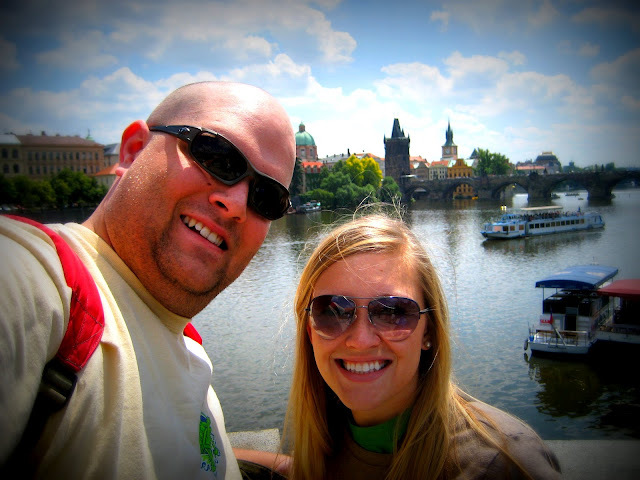 I realized I've mentioned our month-long trip to Europe before, but I've never thoroughly posted about our travels. It was still the best time of my life, and I have no problem reliving it. As the three year anniversary of our trip is approaching this month, it's the perfect moment for a little time travel. A brief note :: we flew to Europe via stand-by. While it was the cheaper option, it was definitely the most stressful. We ended up not flying out after a whole day in the airport but were able to hitch a flight to London the next day. While at Heathrow, we booked the first flight to Prague since that's where our first hotel reservations were. After finally arriving and checking in, sans luggage because best believe it will get lost, it was amazing to finally feel settled. Seriously, we pricelined a lot of our lodging in Europe. We got some amazing deals (read: $60/night in Munich), but this was three years earlier. We spent three nights in Prague, and it ended up being one of my favorite cities. It is absolutely beautiful and stunning. The city was not majorly hit during World World II so much of the "old world" beauty remains in the city. We spent our first day just walking around exploring Prague. 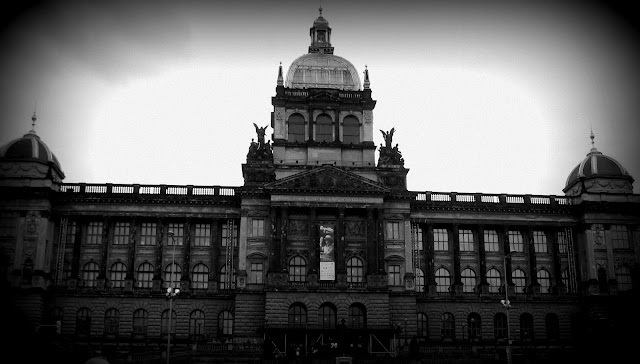 The Prague National Museum is really amazing. Of course after sight seeing, we spent plenty of time eating and drinking in the city. The bars have rich histories, some of them dating back to the 1400s! We started at Novomestsky Pivovar which is in the center of the city. They brew their own beer and have their own restaurant. U Fleku was next on our list. 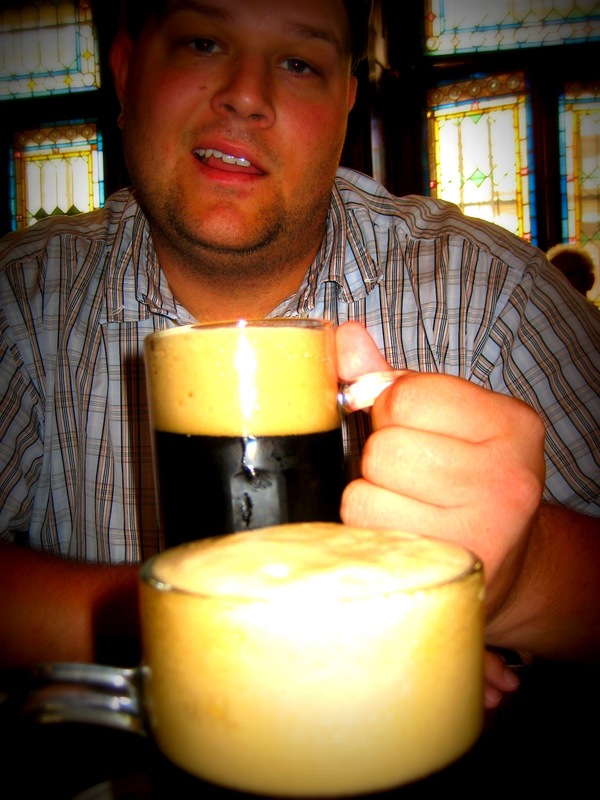 It was highly recommended to us by other beer lovers that had ventured to Prague. Upon entry in the bar, you're greeted with beer. It's thrusted down in front of you with each additional beer recorded with notches on your coaster. The beer is delicious, but the atmosphere is in close competition to win your love of this bar. We sat at family-style tables and enjoyed the accordion music. 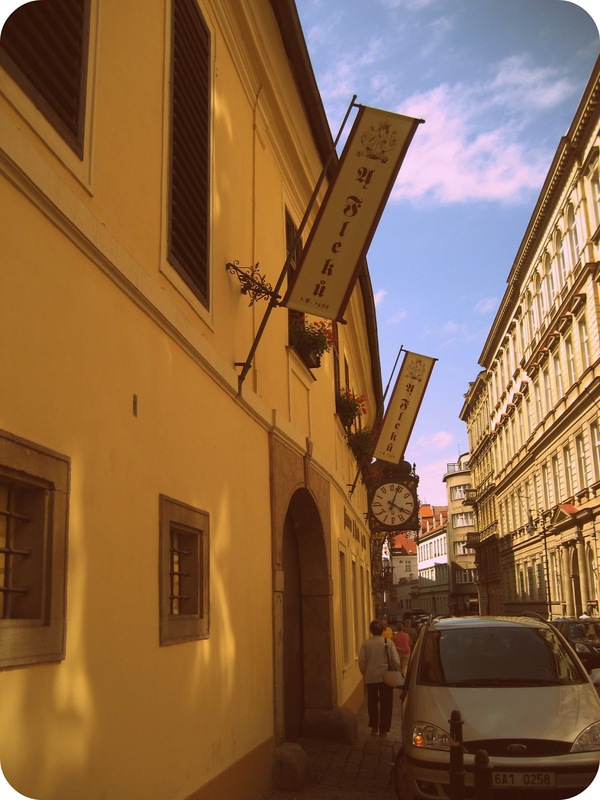 The patrons happily singing, drinking, and eating definitely made this one of our favorite spots in Prague! Our second day in Prague involved lots of walking and plenty of sight seeing. We started by taking the walk up to the Prague Castle, which is the largest fully standing castle in the world. If you needed a reason to visit, the walk up to the castle is gorgeous on its own. We were lucky that it was a beautiful day for visiting. You can get a full view of the real beauty of Prague from the top of the castle. The above picture makes me fall more and more in love with the city every time I see it. We took tours through most parts of the castle area which include a Basilica, a Convent, and a Cathedral. There is even a vineyard! 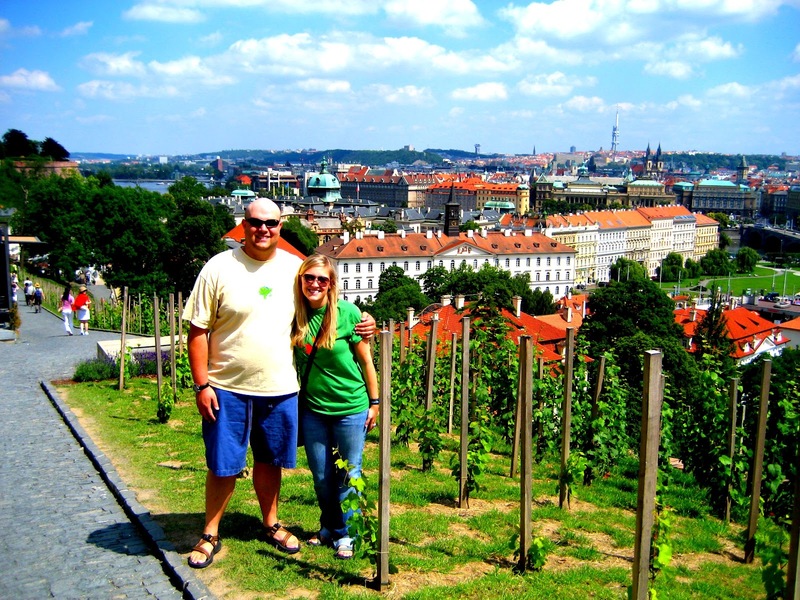 The St. Wenceslas vineyard has a long history; legend has it that it is the oldest vineyard in Bohemia. 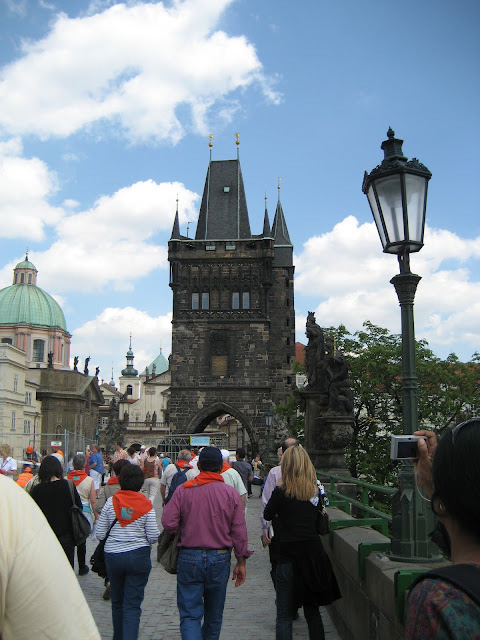 After leaving from the Castle, we took the walk across the Charles Bridge. The bridge dates back to 1357 and connects the two sides of Prague. The bridge is definitely busy and dotted with artists and booths. We spent some time in Prague's Old Town Square. Just observing the architecture and statues in Prague is enough to keep you busy all day. This was one of the best cities to kick off our trip with! The "old" feel of Prague really captured my heart, but the affordability of things sealed the deal. Prague, to my knowledge, has yet to convert to the Euro. This lends to cheaper prices there. I have a dream of revisiting Prague in the winter when there is snow on the ground! I'm also linking up with Kelsey today! Don't forget my giveaway ends TOMORROW!! You lucky girl. How beautiful! 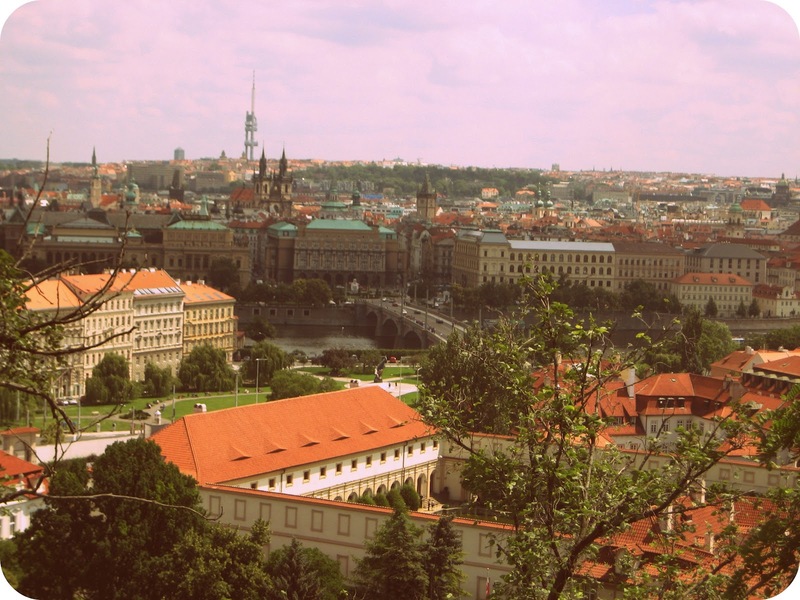 Prague is definitely on my list - it looks gorgeous! oh my goodness, i hate you. ok, i love you again..